Late last month, this beautiful couple finally tied the knot and Felipe & Greg were there to capture the festivities. 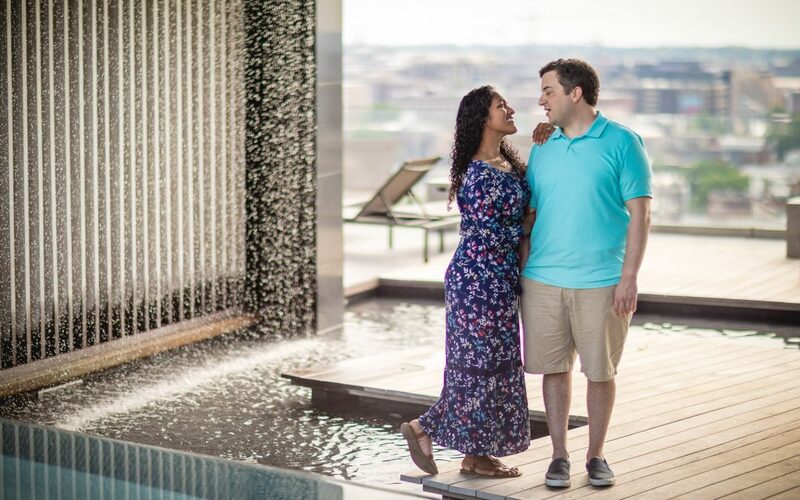 But, before that Felipe met up with them at the Kennedy Center in Washington DC for a romantic and scenic engagement session. The trio started their session on the rooftop of the couple’s DC home, which provided a gorgeous scenic view of residential Washington DC. Shortly after, they headed over to the Kennedy Center, where Hamilton was on the marquee. Wandering around the towering pillars and massive stone walls, they found some beautiful, and somehow almost ‘cozy’ images among the gigantic architecture. Finally, spent on the theater, they headed over to the Lincoln Memorial for a couple of quick shots with an iconic view of the Washington Monument in the background. The session was a meandering, and sentimental adventure, and the results speak for themselves. If you’re interested in working with Felipe on your Engagement Session, be sure to check out the portraits page here on our website!